The best thing about Tim Burton’s live-action version of “Dumbo” is that it reminds us what was so charming and indelible about the 1941 animated classic: it was actually about Dumbo, the adorable baby elephant with abnormally large ears who discovers he can fly. 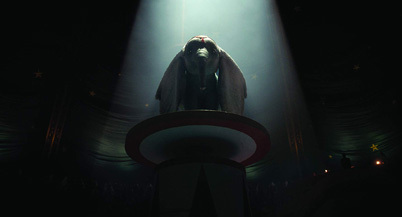 Though Dumbo never talked, his big blue eyes and captivating facial expressions relayed the most heartfelt of emotions and we were right there with him, every step of the way, as he endured a series of misadventures to not only become star of the circus but to finally reunite with his beloved mother. Burton’s rendition, on the other hand, puts its human characters at the forefront, and they’re unfortunately not as charismatic or sympathetic as the cartoon pachyderm. It also doesn’t help the film’s production, as a whole, feels cold, dreary and hollow, almost as if it was shot and rendered with a semi-opaque filter that prevented light from breaking in and livening things up. The movie lacks an essential life force, which is key to these now-annual, live-action Disney remakes succeeding, and, in turn, having the ability to stand on their own and justifying a remake in the first place. For the record, I wasn’t seeking the same experience as the animated version, but I was yearning to make the same kind of emotional investment. I mentioned the new film’s murky production, but I think its underlying issue rests with the rather mundane and passionless storytelling. One of the lasting elements of the animated film was the relationship it established between Dumbo and his mother. In just a few short scenes, in a limited amount of time (the film runs only 64 minutes), the filmmakers got us to really appreciate Dumbo and his mother’s special bond, and so it tore us when the two get separated after a circus show mishap. Our feelings of heartbreak and pity culminated with Betty Noyes’ rendition of “Baby Mine” on the soundtrack as Dumbo and his mother touch trunks through metal bars. That kind of pathos isn’t found in Burton’s film. There are human relationships, including parent-child ones, but none of them are especially profound. In fact, Ehren Kruger’s screenplay, working from the same book by Helen Aberson and Harold Pearl that inspired the original, only seems to include them as part of a “family movie checklist” instead of making us believe these people really care for each other. Meanwhile, the digitally-rendered Dumbo, who is legitimately cute and lovable, gets relegated to a more supporting role, while his mother is all but absent, so the film doesn’t give us enough to latch onto emotionally, which is sort of the point of a movie like this. The plot is nothing to write home about either, as it merely provides an adequate rather than inspirational platform to stage the action. It takes place in 1919 and revolves around the innerworkings of the traveling Medici Brothers’ Circus, which has been hit hard financially amidst World War I. Owner and manager Max Medici (Danny DeVito) has a had to cut several acts due to low attendance, and that includes selling his horses, which were trained and performed on by Holt Farrier (Colin Farrell) and his wife. Holt returns from the war an amputee after losing his left arm and greets his two kids at the train station—daughter Milly (Nico Parker), who has a knack for the sciences; and son Joe (Finley Hobbins), who would love nothing more than to show you his handstand. But Holt’s wife is nowhere to be found, and Max relays the sad news she passed away. I found this particular aspect of the screenplay callous and unsettling because of just how little time it devotes to Holt processing such devastating news. He barely sheds a tear, nor does he seem all that interested in how his kids have managed the past few months on their own. All Holt seems to care about is getting back to work, but with no horses to tend, Max makes him the caretaker of his newly acquired pregnant elephant. Mrs. Jumbo, as she’s known, soon gives birth to a calf, aptly named Jumbo Jr., who comes out with unusually large and floppy ears. Max initially tries to conceal the baby’s supposed deformity from the public, but when Jumbo Jr.’s inaugural performance under the big top goes awry, the people catch sight of his secret and a tragic incident ensues. Max has no choice but to sell Mrs. Jumbo, while the two Ferrier kids, comforting the now-named Dumbo after being abandoned, discover his large ears actually enable him to fly.